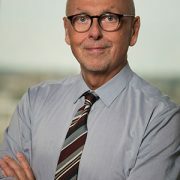 Children’s National Health System researchers processed H1-MRS data using LCModel software to calculate absolute metabolite concentrations for N-acetyl-aspartate (NAA), choline (Cho) and creatine (Cr). Preterm infants had significantly lower cerebellar NAA (p=<0.025) and higher Cho (p=<0.001) when compared with healthy term-equivalent infants. The area of the brain within the red box is the cerebellum, the region of interest for this study. Premature birth, a condition that affects approximately 10 percent of births in the United States, often is accompanied by health problems ranging from difficulties breathing and eating to long-term neurocognitive delays and disabilities. However, the reasons for these problems have been unclear. 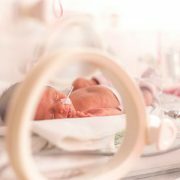 In a study published online Aug. 15, 2017 in Scientific Reports, a team of Children’s National Health System clinician-researchers reports that prematurity is associated with altered metabolite profiles in the infants’ cerebellum, the part of the brain that controls coordination and balance. Pre-term infants in the study had significantly lower levels of a chemical marker of nerve cell integrity and significantly higher concentrations of a chemical marker of cellular membrane turnover. It has long been clear that prematurity – birth before 37 weeks gestation – is accompanied by a number of immediate and long-term complications, from potential problems breathing and feeding at birth to impairments in hearing and sight that can last throughout an individual’s life. Neurocognitive developmental delays often accompany pre-term birth, many of which can have long-lasting consequences. Studies have shown that children born prematurely are more likely to struggle in school, have documented learning disabilities and experience significant delays in developing gross and fine motor skills compared with children born at full-term. Several studies have investigated the root cause of these issues in the cerebrum, the structure that takes up the majority of the brain and is responsible for functions including learning and memory, language and communication, sensory processing and movement. However, the cerebellum – a part of the brain that plays an important role in motor control – has not received as much research attention. 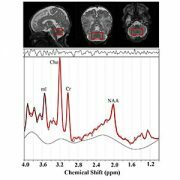 In the new study, Limperopoulos and colleagues used a specialized MRI technique that allowed them to parse out differences in which molecules are present in the cerebellum of full-term infants compared with premature infants. 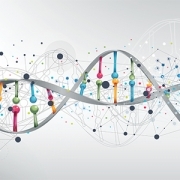 Their findings show a variety of differences that could offer clues to explain developmental differences between these two populations – and potentially identify ways to intervene to improve outcomes. The researchers recruited 59 premature infants, born at 32 or fewer weeks’ gestation, and 61 healthy, full-term infants. 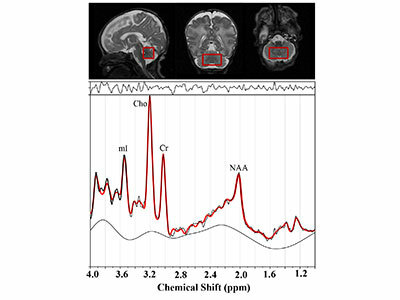 Each baby received a special type of MRI known as proton magnetic resonance spectroscopy, or H1-MRS, that measures the concentrations of particular molecules in the brain. The full-term infants had these MRIs shortly after birth; the pre-term infants had them at 39 to 41 weeks gestational age, or around the time that they would have been born had the pregnancy continued to term. Looking specifically at the cerebellum, the researchers found that the pre-term infants overall had significantly lower concentrations of N-acetyl-aspartate (NAA), a marker of the integrity of nerve cells. They also had significantly higher concentrations of choline, a marker of cell membrane integrity and membrane turnover. Concentrations of creatine, a marker of stores of cellular energy, were about the same overall between the two groups. However, the researchers found that brain injuries, which affected 35 of the pre-term infants but none of the full-term infants, were associated with significantly lower concentrations of NAA, choline and creatine. Having a neonatal infection, which affected 21 of the pre-term infants but none of the full-term ones, was associated with lower NAA and creatine. The findings could offer insight into exactly what’s happening in the brain when infants are born pre-term and when these vulnerable babies develop infections or their brains become injured – conditions that convey dramatically higher risks for babies born too early, Limperopoulos says. The differences between the full-term babies and the pre-term ones reflect disturbances these cells are experiencing at a biochemical level, she explains. 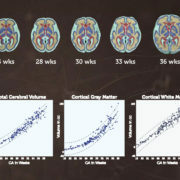 Limperopoulos and colleagues note that more research will be necessary to connect these findings to what is already known about developmental problems in pre-term infants. Eventually, she says, scientists might be able to use this knowledge to develop treatments that might be able to change the course of brain development in babies born too early, getting them on track with infants born at term. “We know that the bodies of pre-term infants demonstrate a remarkable ability to catch up with peers who were born at full-term, in terms of weight and height. Our challenge is to ensure that preemies’ brains also have an opportunity to develop as normally as possible to ensure optimal long-term outcomes,” Limperopoulos says.